← Nostalgiathon 2012: The Goonies edition! First, it stars Rosalind Russell (also known for His Girl Friday and Gypsy) , who absorbed the character of Mame Dennis so well on Broadway that she had no trouble transitioning her to the big screen. She WAS Mame Dennis. Every moment you see her on screen, you are totally entranced with her. The costumes, the flamboyance, the fun that she is – you just can’t look away! Then there’s the story. In September of 1929, Mame Dennis is an eccentric socialite known for her vast array of friends and wild parties, but is thrown a curveball when she has to raise her nephew after the death of her brother. Refusing to compromise on her lust for life and the variety it holds, her lifestyle clashes with the conservative executor of her nephew’s inheritance. The movie is filled with awkward yet hilarious moments, true-to-life struggles, and life lessons that are meaningful even today. 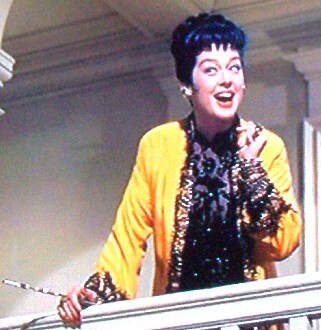 Auntie Mame: She’s not English, darling… she’s from Pittsburgh. Auntie Mame: Well, when you’re from Pittsburgh, you have to do something. Of course, we cannot forget the supporting cast – Forrest Tucker as the southern gentleman Beauregard Jackson Pickett Burnside, Coral Browne as Mame’s best friend Vera Charles, Fred Clark as the trustee Dwight Babcock, Roger Smith as the elder version of Patrick Dennis (and also still living and with famed actress/wife Ann-Margaret), Patric Knowles as Mame’s long-time friend Lindsey Woolsey, Peggy Cass as Mame’s transcriptionist Agnes Gooch and Yuki Shimodo as Mame’s butler Ito along with other wonderful character actors. Auntie Mame: Run along to Ito and tell him to bring me a light breakfast – black coffee and a side car. Oh, oh. And a cold towel for your Auntie Vera. Patrick Dennis: Is she in the guest room again? Auntie Mame: Since Sunday, dear. Now run along to Ito and hurry my tray, darling. Your Auntie needs fuel. I tried to find some good clips from the movie that would really highlight some of the best parts, but honestly, I found this video put together with a Hannah Montana song and (oddly enough) I think it does the job! Enjoy! 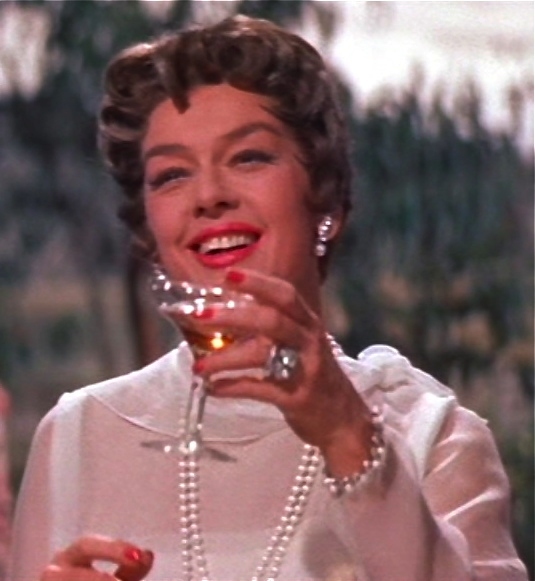 Posted on November 17, 2012, in Film, Reviews and tagged 1958, Agnes Gooch, Auntie Mame, Coral Browne, eccentric socialite, entertainment, Forrest Tucker, Fred Clark, life is a banquet and most poor suckers, Mame Dennis, oscars, Patrick Dennis, Roger Smith, Rosalind Russell. Bookmark the permalink. 6 Comments. I was not familiar with this then I was forced to watch it and wasn’t sure how I would feel about it but I really enjoyed it! Super fun! I adore that you reviewed this. Such a goodie. I hope you do a review on Gypsy, too. It is spectacular!!! !